If you’re wondering what makes a gaming PC, a gaming PC, the answer is simple: it’s got a better GPU. If you’re wondering what makes the best gaming PC, that can be a little trickier to answer. Luckily, we’ve rounded up some winning options, as rated and raved about by expert testers and enthusiasts alike, to help you find your new setup. Of course, there are a lot of variables at play when it comes to finding the perfect rig for your particular needs, from the scope for customisation to how it fits (or probably doesn’t, in the case of the Overclockers Orion X) into your personal budget. Overall, our best PC for gaming is the Alienware Aurora R7 (read the full review by our friends at TechRadar) for its intersection between power, price, looks, and flexibility, but for our other picks, including everything from compact console-sized options that’ll fit in your media centre to completely over-the-top but undeniably amazing behemoths, keep reading below. If you’re looking to build your own rig, there are certainly worse places to start than the Alienware Aurora R7 – which is good, because it’s not the most affordable option out there. Nevertheless, if you’re serious about your setup, and you like the flexibility of having a customisable gaming PC on your hands, expert testers say it’s more than worth it. Our best gaming desktop is a powerhouse, and a pretty one too, despite being on the bulkier side. Its GPU and CPU performance is undeniably strong as is, but the fact that it can be configured to deal with 4K and VR as technology carries on its inevitable march is great. The MSI Aegis Ti3 is outrageous in the best possible way. It looks like it was birthed from a meteor, with its chunky Transformer-esque chassis and dramatic lighting, and while it does demand a lot of space, it more than earns its considerable footprint with impeccable processing power. Its world-class spec includes Intel Core i7 6700K processor and dual GTX 1080 graphics cards along with more memory than we know what to do with, great for 4K gaming. Even under high stress from demanding games, testers found the Ti3 more than met the challenge and offered a superbly smooth experience. After the enormous Ti3, the Corsair One Pro looks especially tiny, but testers say you shouldn’t be put off by its small stature. This compact machine is wiry and wily, with lots of tech tightly packed and super-fast processing courtesy of the Intel Core i7-7700K, as well as an impressively compact cooling system. Unfortunately it’s the intricacy of this system that reviewers say makes upgrading a little more difficult than it might be on other models, but if you’re not interested in taking it to bits any time soon (and with 4K and VR easily within its scope, why would you?) it makes a great small option. Forget what we said about the T3i being outrageous, because when it comes to both capabilities and cost, the Overclockers Orion X takes the biscuit. The diamond-studded, solid gold biscuit. At a cool £27,000, it might be one for very serious gamers and eccentric millionaires, but in fairness, they really don’t get better than this. It has the power of two whole PCs, one packing an 18-core Intel Core i9 processor and the other suitable for use as a server or streaming host, making this easily the most powerful PC on our list. And, as the name suggests, it’s pre-overclocked, so no tinkering necessary. ASUS might be renowned for their slick laptops and understated hardware, but the Stormtrooper styling of this gaming PC leaves no doubt that it’s one for the players. 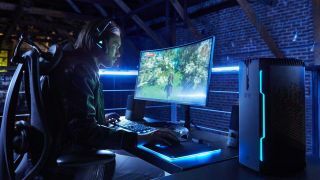 From the brand’s ROG (that’s Republic of Gamers) line, it’s a full-tower gaming rig with style to spare, and offers a surprising amount of customisability, from the side panels to the interior LEDs. While decidedly on the bulky side, there are some decent specs in there to justify the size, including a Nvidia GeForce GTX 1080 card that operates up to and at 4K resolution, and a good cable management system to keep everything in check. This console-sized and -styled PC is an awesome slimline option for space-starved gamers that offers more power than the PS4 Pro. A mini gaming PC is always a thing of beauty, but reviewers agree the MSI Trident 3 is the best thanks to its combination of compactness and competence. In a body with roughly the same dimensions as an Xbox, it packs an Intel Core i7 processor and Nvidia GTX 1070 graphics, and does so for a very competitive price, beating the Corsair One for affordability and comparable spec, and its tasteful design means it isn’t quite as visually intrusive as some of our larger options. With its impressive set of specs, this liquid-cooled gaming PC is a great pal to have on side for ultra-demanding games. There’s a huge amount of RAM, certainly more than you’ll conceivably need; half a terabyte of SSD; i7 Core CPU and muscly GTX 1080 Ti graphics to handle pretty much anything you can throw at it, and it’s not even among the most costly options out there right now. For the sheer amount it can deal with, the abundance of storage, and the excellent value, it’s a good option for those looking to get the absolute best out of their games without remortgaging their house. Our only gaming PC under £1,000 might not, on first glance, seem like a gaming PC at all, but therein lies the magic. It’s an unassuming but capable desktop with a low-key design, but add eighth-gen Intel Core processors and graphics courtesy of an Nvidia GeForce GTX, and you have a very successful crossover. Sure, it’s not actually marketed as a gaming PC, and when compared to some of the behemoths on this list, you can certainly see the difference, but for an entry-level gaming PC that doubles up as an all-purpose home computer, it’s a very solid choice.